Boyd Varty had an unconventional upbringing. He grew up on Londolozi Game Reserve in South Africa, a place where man and nature strive for balance, where perils exist alongside wonders. Founded more than eighty years ago as a hunting ground, Londolozi was transformed into a nature reserve beginning in 1973 by Varty’s father and uncle, visionaries of the restoration movement. But it wasn’t just a sanctuary for the animals; it was also a place for ravaged land to flourish again and for the human spirit to be restored. When Nelson Mandela was released after twenty-seven years of imprisonment, he came to recover at the reserve. Cathedral of the Wild is a story of transformation that inspires a great appreciation for the beauty and order of the natural world. With conviction, hope, and humor, Varty makes a passionate claim for the power of the wild to restore the human spirit. A rare and moving tale. Against one of the most picturesque locales in South Africa—the scenic Londolozi Game Reserve—Varty rethinks family traditions and changing social mores in this intense, insightful memoir that brings together several wise observations about the relationship between nature and humanity. The power of storytelling, Varty writes, is the blood tie that links his great-grandfather who started the reserve as a hunting ground over eight decades ago, and his father, Dave, who established the lush acreage into a nature preserve in 1973. This is more than a tame conservation story of lionesses, leopards, and elephants, but rather a transformative social awakening of Varty’s father and his confidante, Uncle John, of the racist apartheid policies following the bloody 1976 Soweto riots. Some of the most significant scenes in the book involve anti-apartheid activist Nelson Mandela who, following his lengthy prison stint, went to the reserve to rest and conduct terse phone talks with DeKlerk, the president of South Africa. 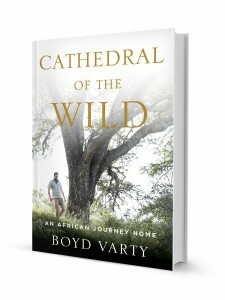 Varty faces his own trials, overcoming a brutal crocodile assault that leaves him questioning his purpose, leading to a spiritual renewal that elevates this memoir above the usual wilderness narrative.